In the last 24 hours the AMS has received confirmed reports about 4 unique fireball events all occurring near 4:00 AM UTC time. 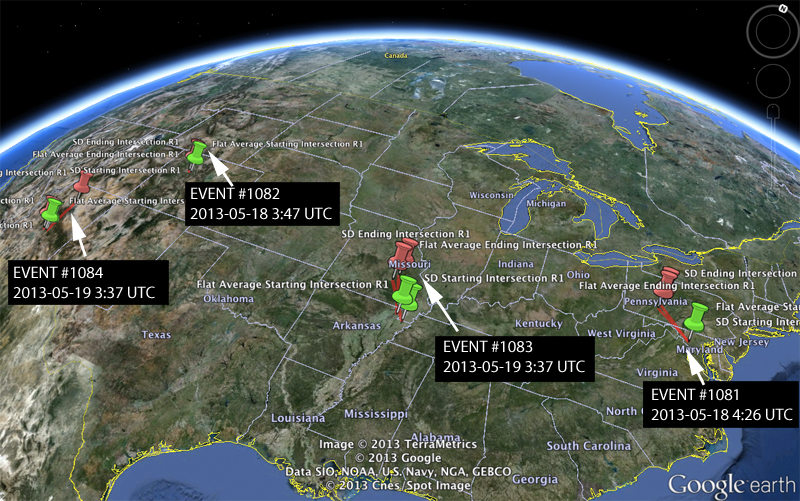 The most recent event occurred in Arkansas and Missouri on May 19th near 3:37 UTC. At the same time 3:37 UTC 4 witnesses reported a fireball in Arizona. The distance between these two locations would inhibit witnesses from observing the same fireball from both locations. On May 18th two large fireball meteors were also spotted within an hour of each other, one over the central east coast and another in Colorado. Below is a table of the events in question. Below is a map of the four events, illustrating the common direction of these fireballs. Google Earth users can download a KMZ file containing the trajectory estimates for these four events (you must unzip the file before opening in Google Earth). If you witnessed any of these fireball events please fill out an official fireball report. On Saturday evening, May 18, 2013, at about 10:00 pm central time, a group of 8-10 neighbors were sitting outside visiting in a community just north of Little Rock, Arkansas. I was facing north and saw a fireball with a distinct green color streak across the sky from east to west. I shouted out and everyone turned to see it, too. I’ve never seen anything like it in my 62 years, apart from the movies. I’m not over-reacting to say that it was nearly unbelievable. That’s why I am on this site – I went looking to see if there were other, similar reports. I think we (my sister, my dad and me) saw this, too, at the campground at Sam A. Baker State Park in southern Missouri at approximately 10 PM. Because of the cloud cover we thought it could not be a meteorite (it was so bright it seemed to be under the clouds). The effect was a flash of blue-green lightning in the clouds and a very bright fireball moving east to west across an arc of maybe 20 or 25 degrees. I saw it too on Saturday, May 18th about 10ish in St. Peters, MO. It was a larger ball of fire colored green and blue. Left a tail of whitish smoke behind it as it streaked across the sky. It was amazing to see. My wife and I were driving back from the Mall in North Little Rock on Hwy 107, heading north, and saw the same thing on the night of the 18th at a little after 10 pm. She saw it first and pointed it out to me. I saw the end of the tail, and a bright blue flash across the sky. It was pretty awesome to see, definitely got me looking to see what it was! You say it left a green streak behind it. Thats unusual…! I was driving north of Nashville, TN last night (5/18) and saw this same green fireball. Very bright. The most impressive thing I’ve ever seen in the sky. hey travis, my family and i live in nashville,tn. im the daughter. i go to college in alabama. i was home with my parents this past saturday may 18th,2013. visiting my parents and my mom and i were driving home from grocery sat night may 18th when we saw the huge fireball fly across the sky. my mom and i were driving home sat night in the car and we saw it in the sky out of our windshield. does anyone know if it was a meteor or gas plasma fireball or what? theres a youtube video called what fell from the sky in middle tennessee and it talks about what everyone saw in the sky in nashville this past sat may 18th on sat night. the fireball. but does anyone know what it was? a meteor? some woman commented under youtube video what fell from the sky in middle tn and she says it was a gas plasma fireball. i wrote her back and told her, i looked up gas plasma fireball on internet and thats not what it was. a gas plasma fireball is just a ball of smoke. thats not what flew across the sky this past sat night may 18th,2013 in nashville that lots of people saw in nashville including my mom and i. but does anyone know what this fireball was that flew across the sky in nashville this past saturday may 18th,2013? We live in England, Ar and were 4 wheeler riding at the same time stated above and were lucky enough to have witnessed this. It was by far the neatest thing I have ever seen and to think my 6yr old got to see it also. So glad to have ran across this site. I will never forget that awesome ball of fire. I was headed to work and seen the green fireball as well. I live in Missouri in the country. Rick, I saw that same event….from near Jonesboro, La. Ditto to all you described! Absolutely amazing and I have seen many! This was the best! Are these parts of the meteorite or old sattelites that are beginning to fall down to Earth? I believe that these are natural meteors that were once one object but fragmented into 4 pieces before plunging through the Earth’s atmosphere. Satellite reentry’s are much less common. Could these be connected to tragic weather patterns ? H@@rp ?? Absolutely not. We have had fireballs before without foul weather. The microscopic particles left in the atmosphere have no effect on the weather. The moon was hit by a large meteor just a few nights ago. I saw a large fireball with a long trail of bright white, purple, green, and red colors in St. Louis on Saturday, May 18th around 10:00 pm, also. It was in the southern sky, moving from east to west, and was very bright and beautiful! I’ve never seen anything like it either! I was just searching to see what this may have been and stumbled across this site. I’m glad to know that others saw what I saw. My sister and I just saw 3 in Sudbury, ON CANADA between the hours of 10:30pm and 11:00pm!! I saw one on 3-17-13 around 930pm in Depauw, IN. My husband thought I was crazy, but now I can prove to him I’m not. Thank you guys for sharing this news. Saw one over east Denver CO foothills – wide green streak – 5/17/13 around 10:30pm. One blew up above my head.a greenish blue light flash.The made a boom sound about a minute later,shock the house.the first fireball landed in my yard.I live in Paragould Arkansas . When did this happen? That had to be an awesome experience! I saw one on May 18, 2013 about 10:30 pm from Louisiana and felt as if it would land in Arkansas. just curious. At the same time as these reports the military was doing fly bys of its new non-manned aircraft….could it be that??? All the places are near the military bases…..Just a thought??? I haven’t looked into it just heard a friend speaking about it…. I saw this meteor fall at about 10:00pm May 18th. It was very cloudy that night and it was like a bolt of lightening which lit up the clouds and then I saw the long bright meteor with a bright tail streaking east to west! In my 65 years I have never witnessed such an amazing meteor. What would cause a meteorite to fragment… collision maybe or could something else also be responsible in the it’s breakup… and after it breaks up… all all the pieces still on the same course or do they break off in separate directions at different speeds… my last question… how close does a meteor have to pass the earth in order for us to feel some kind of repercussions from it’s passing? On February 13th at approximately 4:00 a.m. I was near Burlington, NC on I-85 heading south when a humongous green fireball crossed the interstate in front of me…it was fast! Had it been 10 feet in front of my car it would have been the size of a basketball…considering they also saw it in Greenville, SC (about 200 miles away) it had to have been gigantic. The only difference between all of these sightings and mine was that mine was going west to east…my assumption was that whatever it was landed in the Atlantic. It was gorgeous. I’ve never seen anything like it. It lit up the whole countryside like it was day – green day, but day. I’ll never forget that as long as I live. After a few minutes I decided to call someone to see if I had hallucinated so I called my local TV station in Greenville, SC, and they said that their switchboard had lit up about it, and many had reported a sonic boom with it as well. Wonder why more of these, if they are that big, don’t hit the earth in habitated places? Is it possible that these are chunks of the expected meteor heading our way next Friday, May 31st??? There’s been quite a few discussions on whether or not this could be part of the same meteor??? We would like your professional opinion. Mr. Brian Williams (NBC News Anchor) started a lot of Americans thinking after his statements on last Friday Night. He may on everything statement he made during the news broadcst this evening (Monday, May 20th) I’ll be watching to see if this happens. Meant to print: Mr. Brian Williams may “walk back” all the statements he made LAST Friday, May 17, 2013 just before signing off… I’ll be sure to watch his broadcast this evening (Monday, May 20, 2013) to see if he does…??? Observed Event #1083 as brilliant green fireball arcing down from my WSW to due W from Carbondale IL; visible several [3?] seconds ,maybe about the size of a BB (as one looks down at in the palm.) Brilliant green, with a tiny companion fragment travelling alongside close beneath, all leaving thin BLUE trailing lines likewise crisp and brilliant, (even with very few stars visible and brite half moon at same asimuth). Meteors ZIP; Green Fireball seemed to be moving slower, reminding me somehow of our word “incoming,” burning its way almost deliberately toward our precious planet. Contrary to current logic, there seemed to be a vaguely spiritual facet to this still imperfectly understood phenomenon. It is just possible that I am forever obsessed now with meteors, and am only just beginning to be aware it. Formidable. Beautiful in the extreme. Very bright green in front, red in rear, We were driving westbound on hwy #1 towards Langley BC from Abbotsford BC, at 2:00 AM, returning from a hospital visit with ailing family member, it flew across us starting at about 20 degrees above the western horizon from the north heading south. Very fast, too fast to be an airplane, too bright to be airplane marker lights, The night sky was cloudless and clear no moon was visible. I saw one that left a green streak behind it also on Super Bowl Sunday right before the power went out in the dome in Belle Chasse, LA. It was huge! These sound like that one we seen. I saw a fireball on 5/18/13 while sitting on the patio at a friends home in Surprise AZ. I am not sure what time it was that evening. I did not hear any noise associated with it. I was outside on Monday Morning 5-27-13 around 1 a.m. in the morning and I saw what I thought was a shooting star, but after reading up on it I think maybe it was a fireball. It lasted maybe 5 seconds and it was blue and orange in color. I saw it over the Fredericksburg Area in Virginia. It was very cool. Small asteroid 2013 LR6 will safely fly past this evening at 9:42 p.m. PDT (which is June 8 at 12:42 a.m. EDT/June 8 at 04:42 UTC) at a distance of about 65,000 miles (105,000 kilometers) above Earth’s surface. The space rock, which is about 30 feet (10 meters) in diameter, will be above the Southern Ocean, south of Tasmania, at the time of closest approach. Asteroid 2013 LR6 was discovered by the NASA-sponsored Catalina Sky Survey on June 6. Myself and group of friends saw a huge flash in the sky and when we looked up there was a trail of red orange fire. It happened around 2 or 3 am june 24th in sioux city iowa. Friday night around 1130 at night I believe I saw a meteor burst 75feet off the ground leaving a green trail burning out 20 to 30 feet from the ground. I was located 40 mile south east of Amarillo 6 miles north of lake Mackenzie heading toward the town of Vigo Park. The line of travel was south to north. Went to look for it the next day but could not find anything. Figured I was looking for something the size of a marble. I didn’t hear any explosions. It was a new experience for me so any experience explaining what to look for would be appreciated. As far as I know it could have been 3 miles away. Many folks comment on how close fireballs appear. In reality though, fireballs lose the velocity to produce light at around 5 miles altitude. Therefore the object you witnessed was much further away than you thought. Unfortunately we do not have any other reports of your object so we cannot determine with any accuracy just how far it was from you. If remnants did survive down to the ground, you are probably correct about the size. A brilliant Green Fireball streaked across the Southern sky at 0625am EDT on 22 Sept 2013, travelling SW to NE along the horizon. It was visible for about 5 seconds. I live in the Blue Ridge Mountains of North Carolina at latitude 35.573 deg. N and longitude 82.789 deg. W.
on Nov. 19 between 9:30 and 10pm. i went out to smoke and saw a white ball of fire coming from the south eastvgoing north west over AFFTON. It was a solid white ball with a white tail behind it. Went out of sight in seconds. I even told my wife just in case. After reading what I had written I discovered an error. The direction written was backwards. It was coming from Northeast going Southwest.Hopefully someone else will have spotted it in Affton. Like I said, it was a white orb shaped object glowing white with a white tail behind it.